Fraker Fire Protection Inc. offers testing, repair, and installation of a variety of fire protection systems, including elevator recall systems, in Los Angeles, CA. If your office building, apartment building, commercial building, or governmental building has an elevator recall system installed, you are required to have this system tested annually on a periodic basis. We offer our elevator recall system testing services to businesses in Los Angeles County, Ventura County, Orange County, and the Inland Empire. We are a full-service fire protection company and we comply with all state and local fire department requirements. Elevators are critical modes of transit in a large building, and it is critical to ensure the safety of your people in case of an emergency. During a fire emergency, elevator recall systems are designed to return the car to a designated level (usually the floor where the main building entrance is located) and prevent further use of the car by the public until the situation is properly resolved. This action can be initiated automatically or manually. With our elevator recall system testing program, we make it our priority to certify that your system is in proper operating condition. These tests are in accordance with the National Fire Protection Association (NFPA) and are carried out by certified technicians. Elevator recall systems are crucial for firefighter service. It is important for your system to be properly tested and working under the right conditions laid out by the law. NFPA 72 and the California Building Code require that every elevator that travels vertically 25 feet or more, every associated elevator lobby, or entrance area and associated machine room include smoke detectors for elevator recall purposes. The smoke detectors in elevator lobbies and machine rooms set off firefighter service recalls. The system is also usually connected to the building fire alarm system. A detector must be installed within two feet of a sprinkler head or waterflow switch at the top of the elevator hoistways. This is to ensure that the detector shuts off elevator power in the event of a fire in order to avoid danger from a wet elevator braking system and electric shock. Fraker Fire Protection Inc. technicians perform testing and repairs of these systems in compliance with all NFPA and fire department requirements. Elevator recall systems must provide both Phase I and Phase II functionality. Phase I Elevator Recall – This is the automatic process that returns the elevator car to a predetermined floor and disables normal service during a fire emergency. The purpose of Phase I operation is to prevent non-firefighters from being harmed from use of the elevator. Phase II Elevator Recall – This is the manually activated process that allows firefighters to override Phase I safety controls and operate the elevator when necessary. Our elevator recall system testing services cover Phases I & II. Confirm that all elevator landing rooms are equipped with smoke detectors. Determine that all smoke detectors in the elevator machine room and at the top of elevator shaft recalls elevators to main recall floor. Activate the elevator lobby smoke detector on each landing. 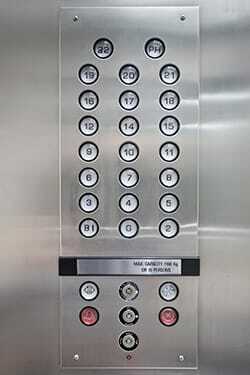 Ensure that each elevator car returns to the main recall floor with the doors open. Determine that the elevator smoke detector functions properly. The Main Recall Floor is another testing area where we determine that there is a working main floor recall switch for each elevator or group of elevators. We will also make sure that the elevator status panel is functioning in proper condition. It is our commitment to provide you with reliable and effective fire protection services from experienced elevator recall system testing professionals serving the Southern California region. The technicians at Fraker Fire Protection Inc. have years of experience with elevator recall system testing and repairs. Don’t allow your elevators to fall out of compliance—you can call us toll-free at (866) 560-3473 or contact us online to learn more about our elevator recall testing procedures.